It’s a special Saturday daytime version of Mister Saturday Night at 12-Turn-13, a loft with hardwood floors, hardwood ceilings, and a big, beautiful roof in the middle of Brooklyn. Bloody marys and mimosas are on the menu; our friend Fiore Tedesco from The Brooklyn Laundry is making egg tacos and other brunch snacks; and you, hopefully, are going to bring your little ones and your dogs! We love it when they come. 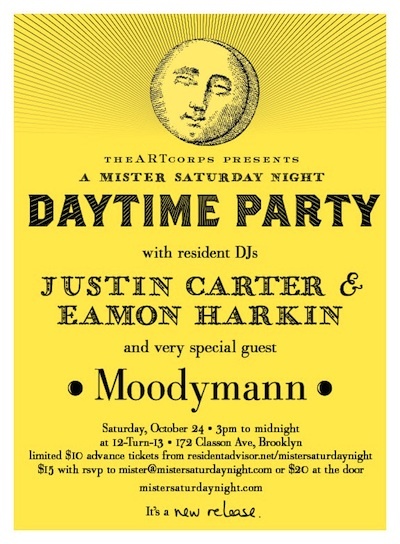 Eamon and Justin will be pulling out their best daytime jams, and our special guest will be a gent called Moodymann. Last time Moodymann came to town, he ended up doing an impromptu late-night version of Freaky MF live with The Egyptian Lover providing backup on 808. The time before that he played radio DJ all night long, announcing nearly every song and shouting out people’s birthdays. We never know what to expect with Kenny Dixon, Jr., and we wouldn’t have it any other way. note. We just got hip to the fact that KDJ did an interview and DJ set on Gilles Peterson’s show on BBC about two years ago. Have a listen. It’s insightful and just plain good.